We began Alpinist almost seven years ago in a moment of serendipity. What would it be like, we wondered, to create the magazine of our dreams? Twenty-six issues later (if you count Issue 0, which we do, and notwithstanding Issue 13, which we skipped) (sorry about that) we close with heartache, but not without a sense of accomplishment. we spent hours, days, weeks, getting everything between our covers just right. We fought to publish Voytek Kurtyka's "Losar," Barry Blanchard's "A Climber's Tale," Colin Haley's "Going Square," Tommy Caldwell's "El Capitan." 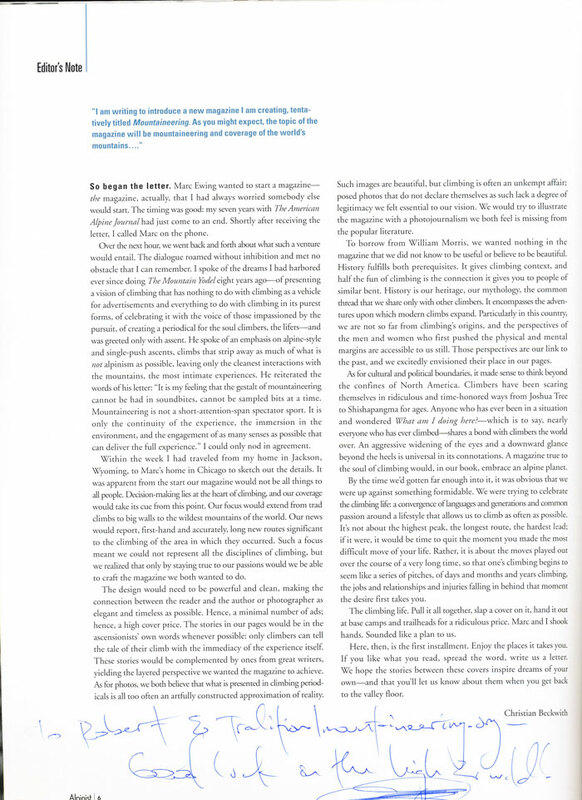 It was an honor to reproduce Giulio Malfer's photographs of climbing's luminaries: from Andrej Stremfelj in Issue 1 to Jonny Woodward in Issue 20, we showcased some of the great climbers of our time. The artwork of Jeremy Collins, Tami Knight, Sean McCabe, Andreas Schmidt; the photographs of Thomas Ulrich, Glen Denny, Monique Dalmasso, Jonathan Scurlock, Andrew Burr: we included all of them according to the William Morris dictum, "Have nothing in your houses that you do not know to be useful, or believe to be beautiful." For six and a half years, Alpinist was our house, you were our guests, and we strove to have nothing in our pages that did not fit Morris' exhortation. When you came up to us and thanked us, we knew you believed so too. One more metaphor. Alpinist was not a standard route to magazine publishing. It was a new route: a subscriber-based publication, big and bold and beautiful. In 1979, as George Lowe described in Issue 15, he and four partners climbed more than 100 pitches on the north ridge of Latok I only to descend short of the top when one of his partners became ill. Though they failed to reach the summit, Lowe calls it his best climb. Alpinist was our Latok, and you were our partners. This was our best climb. Thanks for joining us on the adventure. When I read last week that Alpinist had folded I wasn’t shocked. The glossy climbing magazine, headquartered in Jackson Hole since 2002, had little advertising, a $13 cover price and appealed to a demographic with a penchant for living in pickup trucks. With 9,000 subscribers, it’s clear there was an audience for Alpinist’s uncompromising style. Unfortunately, that audience wasn’t large enough. The mere fact that the lovingly-constructed quarterly had held on long enough to produce 25 gorgeous issues is a remarkable achievement in its own right. From its first issue to it’s last, editor Christian Beckwith and his staff maintained a consistent voice and belief in what they were doing. Ironically, Alpinist had just relocated to a new, larger office space at the end of September. In April, a business office had opened in Chicago. The publication’s web site announced plans for an expansion of the four-year old Alpinist Film Festival. Outdoors and sports magazines generally cater to the lowest common denominator of readership. Covers are splashed with headlines offering “10 hot adventure travel destinations” and token feature stories are wedged between fashion shoots and easy to digest 300-word snippets. Simple stuff for browsing and light reading. Beckwith’s purist aesthetic translated to a sophisticated publication that was a joy to pore over. Alpinist gave a voice to climbers, allowing them to explain and explore why they suffered for their pursuit and why they found such peace in the mountains. It was that voice which made browsing through each issue such a joy. The stories dripped with authenticity, literate reports of agonizing ascents of obscure peaks, all done in the requisite “purist” style. There were no stories of bolted sport climbs. Instead, there were profiles of famous peaks and stunning photography. Alpinist looked and read like a book, not a magazine suitable for stuffing in a backpack with ropes and harnesses. Alpinist wasn’t all smooth sailing. Beckwith was known for his mercurial personality and refusal to compromise his values. Prior to working at Alpinist he was fired as editor of the venerable American Alpine Journal and clashed occasionally with his employees. Some of the pieces penned by well-known climbers struggled to reach the standard of the photography, no matter how heavy the editing hand. Ultimately, it was the magazine’s limited audience and exclusivity that was its undoing. Dirtbag climbing bums, even those with an appreciation for art who supported Alpinist’s core philosophy, have a hard time paying through the nose to look at photographs and read tales of exotic locales. The loss of Alpinist is a reminder that a commitment to artistic excellence and the purist ethic that Beckwith championed and celebrated are not always the foundation of a strong business model. The publication’s loyal subscribers certainly recognize how unique Alpinist was. Some are wondering if the community that Alpinist created can be preserved in some form online. I hope it can. Though ski mountaineering is as close as I come to participating in alpinism as the editors defined it, I could relate to the type of accomplishments they were trying to highlight. I salute Alpinist for its ability to find a niche, for remaining true to its ideals of substance over style, and for a presentation that was head and shoulders above its peers. The climbing world is a better place for its existence, and the publishing world will be a little worse without its presence. Michael Pearlman blogs from Sheridan, Wyoming. "The event will retain the unique look and feel of the master Festival, including a cocktail hour with New Belgium beer, a live DJ, silent auction and presentation of films by star athletes and the director of the Alpinist Film Festival, Christian Beckwith. The Bend Event will be a fun gathering of the local community in an ongoing celebration of the adventure lifestyle. Stay tuned for more information about the Bend Event". Print the poster for a friend. See the website. Mazamas Link of the Month: Alpinist Magazine Re-launches! 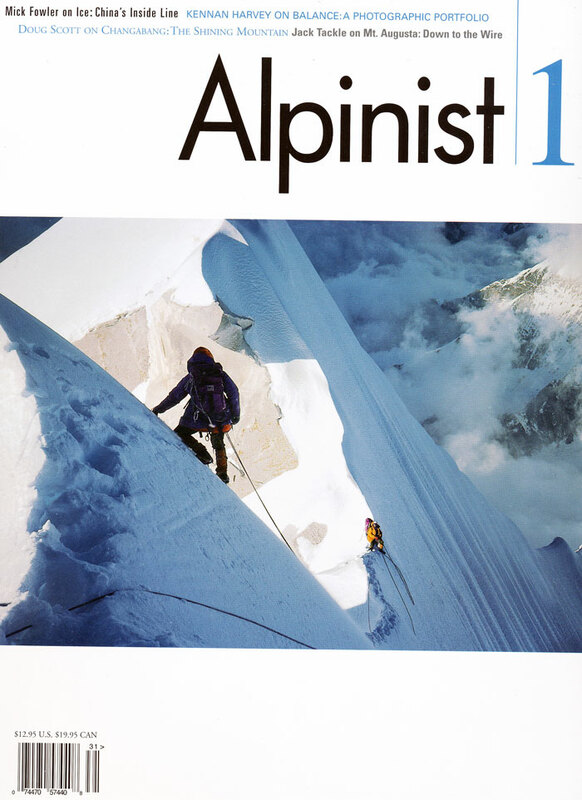 Alpinist Magazine formally closed its doors in November of last year. A week ago we found out that the owners of Backcountry and Telemark Skiers’ Magazines have decided to re-launch this premium mountaineering publication. The new publishers plan to pick up where the magazine left off with Issue #26 in March and will honor all current subscriptions! Mountain climbing has inherent dangers that can in part, be mitigated!